When Atom was first released, the API was a product of organic growth. At the time, we were the only consumers of the API, so we added methods here and there guided by the needs of the internal packages. The resulting API was incomplete and inconsistent, but it was a necessary step in the evolution to our API today. It was a period of exploration. What kinds of things do we need to do? How should those things be exposed? The original API that shipped with Atom ended up being a great rough draft. After releasing Atom into the wild and seeing hundreds of packages written against the API, our understanding of the requirements deepened. We saw what people were struggling with, what was slow, and patterns many package authors were repeating over and over. This knowledge led to a major refactor of the API and new docs that were released nearly 6 months ago. Since then, the new API has been holding up with minimal additions to the nearly 1000 new packages and 800 upgraded packages. Atom 0.206.0’s startup time and general performance has improved—it no longer needs to emit old events or create unnecessary objects. Removing these APIs also frees us up to make optimizations that would be hard to shoehorn into the code in a backward-compatible way. These packages are not dead forever! You can load them once they are updated to be deprecation free. If you see a package on the list that you rely on, feel free open an issue on the package repo, or offer to take over as maintainer. For a short time you will still be able to load deprecated packages by starting atom with the --include-deprecated-apis flag. e.g. atom --include-deprecated-apis . This will both enable the deprecated APIs and allow packages that use these APIs to load. To be clear: we plan to remove this flag and all of the deprecated APIs before the end of June. But we wanted to offer a way out for people who depend on a deprecated package. 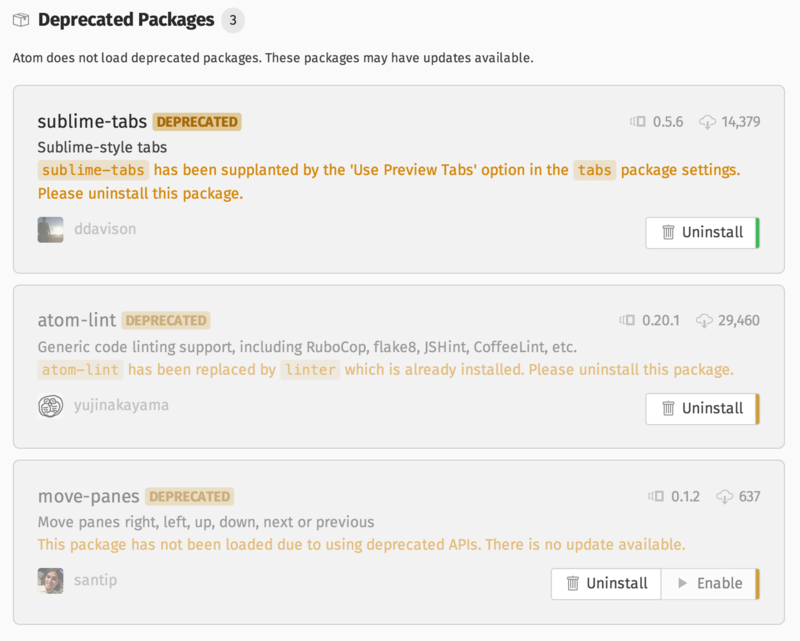 Even though packages that won’t load may cause some pain, removing deprecated APIs will pave the way for a tighter, more consistent, and more performant Atom. Shedding the weight of our original API gets us one step closer to Atom 1.0, helps us remove code debt, and frees up the core team to focus on user-facing tasks. I wanted to give a huge shout-out to all those who updated their packages in the last two weeks. You have significantly reduced the frustration caused by removing these APIs.